Leeds, UK, 22nd March 2016 – A FANTASTIC MILESTONE, BigChange customer BOBST is embarking on this anniversary with its sights focused firmly on the future. From autumn 2015 to autumn 2016 it will hold a year of events running under the motto “125 YEARS: FOR THE NEXT GENERATION”. 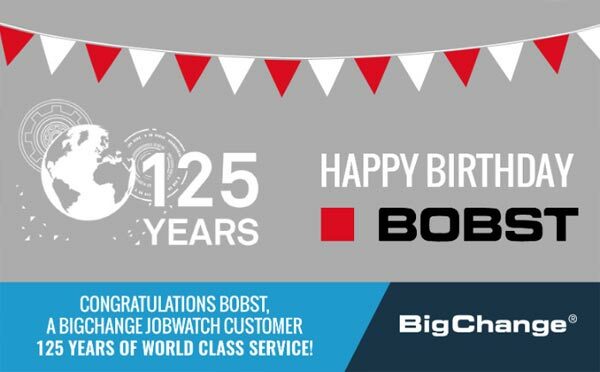 BOBST has chosen this slogan first of all to thank its customers who have placed their trust in the brand for 125 years. It is also to pay tribute to its staff, whose enthusiastic work has given the brand’s products and services their renowned excellence. Innovation is written into the company’s DNA, it is at the core of its strategy and has resulted in close to 1’350 patents. Today, BOBST offers equipment which provides a targeted response to its customer’s individual requirements. Its digital print systems open up new, highly profitable, outlets and give manufacturers as well as brand owners innovative solutions, especially in personalized production and short runs of packaging and labels. Jean-Pascal Bobst, CEO of the Group and great-grandson of the company founder. BOBST places customer satisfaction at the centre of its operations and has been one of the first manufacturers to offer a complete range of services. The Group intends to keep on investing in its personnel and launching new products to meet the needs of the market and consolidate its long-term growth sustainably. The BOBST vision, based on strong human values, has always been the driver of its success and will remain at the core of the next generation’s business project.